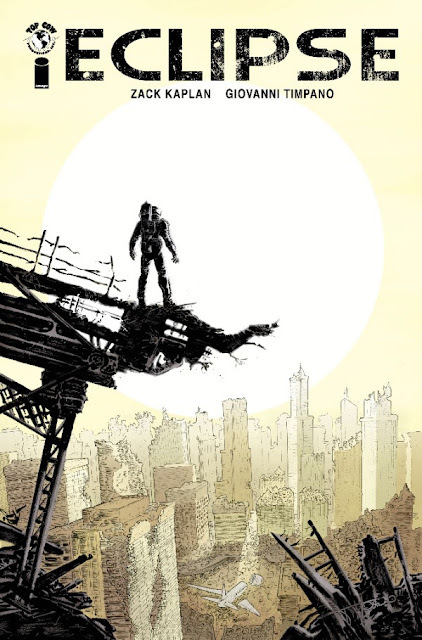 Fan-favorite creative team Zack Kaplan and Giovanni Timpano will release the first trade paperback collection of their ongoing gritty sci-fi/horror series ECLIPSE this February from Image Comics and Top Cow Productions. In the near future, a mysterious solar event has transformed the sun’s light into deadly immolating rays. The world’s few survivors now live in nocturnal cities, unable to survive the daylight hours outdoors. But a killer has emerged who uses sunlight to burn his victims—and when he targets the daughter of a solar power mogul, it falls to a disillusioned solar engineer to protect her. ECLIPSE VOLUME 1 (ISBN: 978-1-5343-0038-5) hits comic book stores Wednesday, February 15th and bookstores Tuesday, February 21st, and will be available for $9.99. It can be ordered by retailers with Diamond code DEC160754, and it is available for preorder via Amazon, Barnes & Noble, Indiebound, and Indigo.